(Read page in its entirety before completing forms) You can see an instructional video that walks you through the graduation application process here. A list of all graduation deadlines. NOTE: Fogelman College of Business and Economics Master's Students must proceed to the following web site to review FCBE deadlines for candidacy form(s) submission. NOTE: This form must be submitted at least three weeks prior to the date of your defense. If you have trouble with the DocuSign candidacy forms, you may submit the paper candidacy forms to the Graduate School. Here is a link to the masters, doctoral, and certificate paper candidacy forms. Remember, you will be responsible for obtaining all the necessary signatures. Failure to submit BOTH the graduation application and the degree and/or certificate candidacy form will delay your graduation until the next semester. We strongly recommend that you send the candidacy form to your departmental advisor at least 1-2 weeks prior to the submission deadline so that the form will reach your respective College Director of Graduate Studies by the required deadlines. Any received after the deadline will NOT be approved or forwarded to the Graduate School for processing. NOTE: Beginning with the fall 2015 semester, a fast track option is available for students to request late processing of their candidacy form and/or their MyMemphis graduation application to be expedited after the deadline. A $500 fee will be assessed to cover the expedited services to complete the graduation application process. A Request to File for Graduation after Semester Deadline form may be obtained from the following website: www.memphis.edu/gradschool/resources/forms_index. Students completing a Graduate Certificate program must be officially admitted to the program in order to both apply to graduate and to officially receive the certificate. If you are not admitted, please submit a Change of Status application to Graduate Admissions (FedEx Institute of Technology, 201) immediately. Students completing an Education Specialist degree may substitute the College of Education Education Specialist Program of Studies and Candidacy form for the Graduate School candidacy form. If you have not completed the EdS Program of Studies, the form must be completed and submitted to the College Director of Graduate Studies by the deadline listed below. 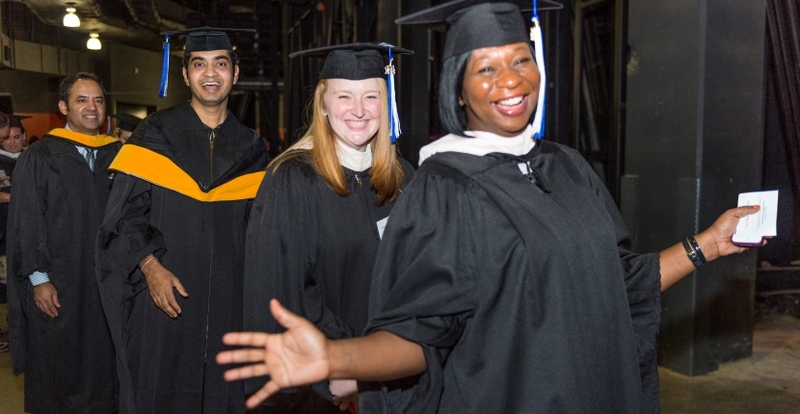 Students will be certified for graduation only when all degree requirements are met, including the removal of all "I" or "IP" grades earned from previous semesters and the successful completion of comprehensive examination requirements or final approval of master's theses or doctoral dissertations. Carefully review Step 1 - Prerequisites to Graduate. Click on Step 2 - Apply to Graduate to complete application. Once Step 2 has been completed, proceed to Step 3 - Diploma Mailing/Cap and Gown form. All students are required to complete both the Diploma Mailing and Cap and Gown form, even if there are no plans to attend graduation exercises. For students completing only a graduate certificate program, there will be no access to the Cap and Gown portion as these students are not allowed to participate in graduation. During the middle of every semester, the Commencement Office will provide graduating students access to Step 4 - Attendance Card.